Syria has slipped deeper into the abyss. Perhaps as many as 220 people have been killed in a farming town, Tremseh, northwest of the city of Hama, by shelling and shooting from Syrian forces. 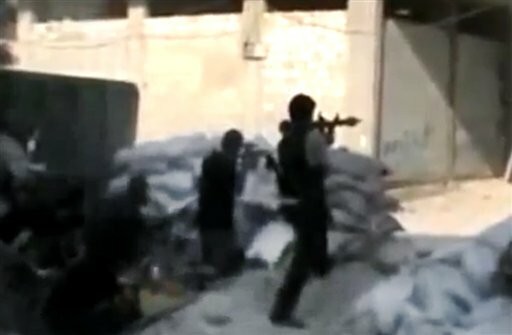 Reports suggest that the town was first attacked from the air and then stormed by militiamen who slaughtered civilians. As bodies were grimly laid out in mass graves on Friday, the opposition called it a massacre, as did Secretary of State Hillary Rodham Clinton. The assault appears to fit a pattern of ethnic cleansing in which government forces and militias from Alawite villages are laying siege to largely Sunni towns. President Bashar Assad is an Alawite, part of a minority in Syria that is the backbone of his power. He has brazenly defied appeals from the rest of the world to stop the violent suppression of the rebellion against his rule. Russia is shielding Assad, steadfastly refusing to support stronger measures sought by the United States and others. The U.N. special envoy, Kofi Annan, laid out a plan for a cease-fire and political transition, but it has been shattered by the worsening violence. The risks of inaction are more evident every day. The Wall Street Journal reported Friday that military forces have begun moving part of Syria’s stockpile of chemical weapons, for reasons that are unclear. Perhaps the regime is nervous and wants to better safeguard the deadly nerve and blister agents. Syria also possesses delivery vehicles, including aerial bombs, artillery and missiles. Would Assad, in a moment of irrational desperation, use a chemical weapon against his foes? It would be a grave turn of events. So would the loss of control over the chemical-weapons stockpile. Syria is not believed to possess biological weapons, but intelligence assessments have noted that the country has the technical infrastructure to support development of germ warfare agents. Right now, the chemical agents are a known and worrisome danger. At the end of this week, the mandate for the U.N. mission in Syria expires. In the Security Council, the United States has proposed an extension with a new provision that would invoke stiff sanctions against Syria if a cease-fire does not take hold within 10 days and the Syrian government does not pull back heavy weapons from population centers. The goal is to squeeze Assad harder. But Russia and China, with veto power, don’t want sanctions. The Obama administration has conceded to Russian intransigence on Syria in the past; now is the time to stop. Should the sanctions proposal fail, the United States should allow the U.N. mission to expire. That would end what has been an counterproductive charade of diplomatic activity at the Security Council and open the way for more effective Western action, such as greater support for the Free Syrian Army and for safe zones for civilians. Moscow should be told that if it wishes to avoid such steps, it must back U.N. sanctions.